Chimp took this picture of me on August 19, 2004. I'd been sick 2 1/2 months. My muscles have clearly already significantly wasted away. What do you do when you’re diagnosed with an illness that has no cure? This is the question I found myself confronted by in 2004. Unfortunately, what I did was this: Nothing. That sounds crazy, right? Finding myself sick in a way I never had been, why wouldn’t I do something about it? Why would I choose to do nothing? The truth is, I did nothing for a whole host of reasons. Nothing, first, precisely because I had learned there was no cure. If there was no cure, then I figured there was nothing to be done about it (“…never mind it.”). Nothing because I rationalized that because there was no cure, anybody who claimed to have a treatment for it was potentially a charlatan. Nothing because since I knew nobody knew the cause, I thought nobody could treat it. Nothing because there were so many different treatments out there, and I didn’t know how to figure out whether any of them were effective. Nothing because I didn’t want to choose the wrong approach and waste my money on something that didn’t work. Nothing because most of the treatments were supplements, and I didn’t really believe that supplements would do any good. Nothing because I had never been seriously ill and I didn’t know how to negotiate the healthcare system in anything but the most basic of ways. Nothing because I didn’t know what specialty my new illness fit in to (turns out that’s a trick question – it doesn’t fit neatly in any of them). Nothing because I didn’t know how to find a doctor who did specialize in my new disease. Nothing because I didn’t understand that I needed one of those. Nothing because when I did finally look for specialists, there was no doctor in my area, and I didn’t think it was worth traveling to see one. Nothing because a bad reaction to a previously well-tolerated over-the-counter medication caused me to develop a phobia of taking any new pills. Nothing because it didn’t make sense to do anything when I could just as well do nothing and have that not work. Nothing because I thought I was dealing okay with the illness on my own, and I didn’t really see what any doctor could do for me, given that there was no cure. Nothing not so much because I decided all at once that I had to get on with my life as that I just kept living as much as I could as I always had. Nothing because I figured that I had always gotten better after I’d gotten sick, and that given time, I would get better. Somehow, for all of these reasons, nothing was the thing that made the most sense at the time. Lying behind those reasons was some element of choice, a significant amount of inertia, and a lot of plain old ignorance. When I look back on that period now, of course, I see it through the lens of all the years since, and I wish I’d done things much differently. Doing nothing – and that was my approach for several years – did nothing for me except cause me to get worse over time. Now I know how to deal with my illness. But that’s hard-won knowledge that I gained from my experience of doing nothing, which effectively meant doing everything wrong before I later learned how to do it right. I wish I had spared myself that experience. I definitely wonder whether if things would be different now if I’d had better counsel and made decisions differently from the start. Because the truth is, doing nothing is not doing nothing. Doing nothing, whether consciously or not, was forgoing potentially helpful interventions. It was failing to respond appropriately to my body’s needs. It was allowing the illness to have its way with me. If, instead of trying to “never mind it” away, if I’d really understood what I was potentially up against, and planned for the war rather than fought each battle one at a time as it arrived – where might I be? Knowing what you know now, what would you recommend to someone facing an apparently unknowable, untreatable ailment? You write that “Now I know how to deal with my illness. But that’s hard-won knowledge that I gained from my experience of doing nothing, which effectively meant doing everything wrong before I later learned how to do it right.” What would you suggest to someone as an alternative to learning the hard way? Oh, I have many, many thoughts about that, Ken. That’s going to be a whole post of its own. I wanted to separate the two, because I anticipate potentially using the “what I would tell the newly diagnosed” post to tell the newly diagnosed what I would tell them! Please don’t bemoan what might have been. All you have learned (and shared) is of inestimable value to so many. And rejoice in what you *have* learned and acted on, and where you are now and where you are going from here. Thanks, Dad. Even though I did nothing, I don’t really blame myself for it, you know? I knew very little, and that wasn’t my fault. Nathalie, that’s helpful to hear. Not that I’m glad nothing worked for you, but that sometimes this thing just takes the ground it does whether you actively try to fight it or not. Yes, my advice to the newly diagnosed has a heavy emphasis on pacing. It’s so important. No Poster Girl, I think you most likely did the best thing. From what I have read, I understand that people who did not do all the different treatments tend to be better off than those of us who did. I did the opposite of you. I tried one treatment after another, and I know that some of them made my condition worse and left me with permanent problems. I think you should be congratulating yourself, not wondering where you might be if you had tried the treatments. As always, your blog has gotten me thinking. Thank you, Patricia. I’m sorry to hear that seeking treatment didn’t turn out to be helpful for you either. I wasn’t explicit about this, but my “nothing” includes not only not doing treatments, but also not adapting to and respecting my new limits. That, I think, was my biggest problem. I don’t blame you for doing nothing. i didn’t know what to do, except that I was so sick for the first few years, including with some weird form of hepatitis stemming from the viral illness — that I couldn’t do anything nor did I know what to do, except stay home and rest. After nearly 26 years, I still don’t know what to do except rest most of the time, pace myself very carefully, and take some vitamins. And do whatever it takes to combat that devil of a symptom — sleep disorders, which you have dealt with in your posts. And take medication for specific problems or symptoms. And read everything new that I can about CFIDS — possible causes, physiology of the disease, possible treatments, etc. Other than that, resting, trying to sleep, becoming a fanatical mystery reader — my lifeline — and not overdoing it, eating fruits and vegetables, I’m not sure what to do. I think you’re doing things exactly right, Kathy. Rest, pacing, symptomatic treatment, keeping abreast of the research and nurturing your body as best you can. Sadly, to this point, that’s about all there is for us to do. I relate to so much of what you wrote here. I think it must be hard for people who’ve never been there to understand those of us who do ‘nothing’ (though it’s never quite that simple) …. but being told you have an incurable disease (and worse, one that may just be all in your head) leaves you in an extremely unenviable position. Normally when you’re diagnosed with a chronic illness, there are specialists to guide you through it, help you manage the disease, curable or not. With this illness, even the specialists there are are more often than not fairly ignorant of the different processes happening to our bodies. When I first got ill, I did go to an ME clinic here in the UK … and while my experience was better than many people’s (my consultant was informed enough not to force any treatments on me) … it still didn’t help me understand what was happening to my body or give me any tools to manage it. I think the problem is that without proper medical guidance, we’re left much to our own devices, and that usually means one extreme or another, doesn’t it. We do little, or too much. Try nothing, or try everything – both of which can be very damaging for people with this illness. We need the doctors to learn to show us how to find a healthy balance when we’re first diagnosed … and only then, perhaps, will we start to see less people becoming as severe as those of us have in the first few generations of the disease’s recorded history!! I agree with you all the way through here, Susannah. We fall through the cracks in a way that doesn’t happen to someone with, say, MS, or RA. We are left to fend for ourselves to a shameful degree – so much harm could be prevented if healthcare professionals knew this illness as well as many others are known. I think the best guidance out there is coming from other patients, and it’s just in the last year or two that I feel like we’ve finally achieved a sort of critical mass as a community. I couldn’t find any online community with any knowledge even several years after I got sick, and for many years, I didn’t personally know any other person who had the same diagnosis! There is so much more information readily accessible now as compared to when I fell ill, and even more since when you fell ill. It’s still daunting to try to sort through it, but I’m grateful that it’s there. If I had been told, back 27, almost 28 years ago, that i had a real disease, I would not have made the mistakes that hastened the progression of our illness. This is why it is so important to have a correct diagnosis. If I had been told by my doctors that by pushing my limits, and burning the candle at both ends, would destroy my vascular and heart systems, I would have listened. If I had been told that this disease was not just stress, and i could not just “mind it away”, I would have listened. If I had been told that I could possibly spread this illness to my children, I wouldn’t have had children. But my doctors didn’t tell me any of that. And the government doesn’t tell anyone that. Even twenty years after you fell ill, Debbie, when I fell ill, nobody told me those things either. There are thousands, maybe a million of us out here – it’s not as if this illness has never been seen before. The total lack of understanding of the long-term risks isn’t a matter of its rarity – it’s a matter of its lack of funding. Please don’t fault yourself for what you didn’t know then and only know now in hindsight. I’m an occupational therapist and I went long periods of time not doing anything, not being able to decide what to do. Back then, we were told there was nothing to do and it wasn’t catching. I can see in my medical record “element of fibromyalgia”, but my doctor never even told me this. In fact, I’ve spent the whole last year doing nothing, except exercise which has helped me a lot and may have hurt me a lot, so even with 18 years of knowledge, I still chose nothing. This is not our fault. We’re receiving no guidance from the medical community. Yes, Patricia, I’d sort of forgotten about that – that even the doctors told me there was nothing to do. Well, really they told me that they had no physiological explanation for my symptoms, and because there was no explanation, they didn’t know what to do. And it doesn’t have to be that way – even if there’s no cure, there are approaches to symptom management, and good counsel would make such a difference. I’ve had the illness now for 18 years. I haven’t really tried many treatments so to speak. Mostly wasted money on various vitamins and supplements over the years. I found that doing very little has actually been the most helpful for me. Rest and diet changes I think help the most for me anywy. Although I wish I hadn’t limited so many foods because now I become ill when I try to add them back in. I cut out mostly inflamation producing types foods. These included dairy, most fruits, and most sugar. It makes eating very boring now. I have a milder form of the illness although each year it get’s progressively worse. I’ve managed barely to continue working full time. The rest of my time is mostly spent laying down. Most of my family members are sick with neuroimmune diseases or cancer. I think doing mostly nothing definately helps us or this illness would progress faster. We need the correct medicine and for our governments to do something about this. People don’t stay this ill this long for no reason. I had to cut out all sodium for a long time, so I hear you on the boring diet, Guest. I think you’ve hit upon a key insight there with the phrase “doing very little.” Doing little – learning appropriate rest and packing – is the best measure we have to date. I’m sorry to hear you’re progressing – I was where you were, working and lying down when I wasn’t working – until I couldn’t anymore. I wish I’d stopped working earlier, but not everybody has that option. I didn’t think I did until I absolutely had to. I can empathize with you because like you, I wasted precious time in the beginning. My GP did not recognize my illness and convinced me that I must be depressed. I went through the nightmare of being switched from one anti-depressant to another which all made me sicker and I was drowning in an abyss that took away three years of my life. when I finally figured out what was wrong and went to a specialist who diagnosed me, my body was so broken and I was so ill that the protocol that this doctor uses did nothing for me. Had I come to him right away, there is a good chance that I would have had a major improvement in my health. So, I don’t blame myself, I blame the medical field who is so ignorant and think that every woman who has some complaints is depressed! Agreed, Gabby – not your fault. I, too, had a doctor offer me antidepressants right at the start. I’d been living where was less than a year and I didn’t have a PCP at the time I got sick – just a gyno – so I got a recommendation for an internist from my boss’s wife. After describing my symptoms, the doctor offered me antidepressants. I did have some history with depression – I’d had it particularly badly in high school – so I knew what depression was and I knew that I wasn’t depressed. I told her so and asked her what the antidepressants were supposed to do. She didn’t really answer me. My grandmother and grandfather had this illness. Then my mother, 3 aunts, and my son. My uncle died of a heart attack at age 48. My stepfather died of cardiac arrest at age 53. My uncle-in-law died of ALS at age 56. One of my cousins died of cancer in his early 40’s. Another cousin had a growth hormone defect that caused him to go into puberty at age 3. The women became disabled at about age 30. The men were closer to 40 or 50 when they began to have problems. When I became ill in the Fall of 1975, I began going to one doctor after another and one specialist after another. Every one of them had a different diagnosis for what was wrong with me. 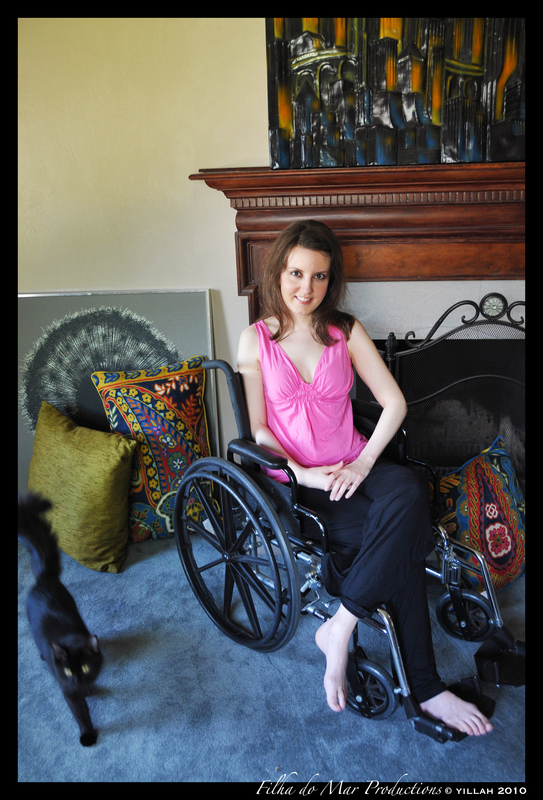 I had never even heard of “CFS” or ME until 1998 – 23 years after I became disabled. The CFS and Lyme disease specialists I went to were not able to help me. Although I try to avoid doctors, it is difficult to do so because I have chronic infections and other problems that require a doctor’s prescription. I don’t want to die. I want to live! And I’m still waiting for the cavalry to come. Oh, Vickie, I feel for you and your family. That’s heartbreaking. You’ve been ill my entire life. I’m sorry. Yes, we’re all still waiting – it felt in the last couple years like the hoofbeats were coming over the hill – I don’t know whether we can still hear them or not now. It is terrible to watch, jsk. Sorry to hear you and your friend also have direct experience of it. I have one friend from childhood who’s been diagnosed within the last couple years. When she started telling me she was tired all the time, I hoped against hope that it would be anything else. It hurts to watch her going through that “I don’t know if I can keep working, but I don’t know if I can stop either” calculus. I hope your friend gets some improvement soon. Thanks Jocelyn. My friend is totally on board now, I just hope it’s not too late. He was diagnosed with MS for about 15 years before I got sick w/Lyme and figured him out after my delayed diagnosis. Even though we’re all outcasts in the eyes of standard medicine, at least we have a great lyme support community with people like you being willing to put it out there. thank you. I agree that doing nothing is harmful, especially when there are a few things that might be resist the disease’s progression even if they can’t eradicate it. I recall one practitioner advising me to take famvir or valtrex only one year into my illness. Although I didn’t do nothing, I made the more egregious mistake (arguably) of wasting money on supposed “cures.” I guess one thing we couldn’t have foreseen was that our idea of recovery changed with time. Back then, I wasn’t keen on taking any potentially toxic drugs because I thought I’d been sick for short enough of a time I thought a cure was still possible. Now, it’s more about restoring quality of life. Ironically the antivirals help most in the first year or two of illness and by the time I was open to them their chance of working had probably diminished greatly. I think starting a post or resource advising the newly-diagnosed is a great idea. Mojoey, I wish I’d heard that advice at the time. I would have been willing to try it – Valtrex is pretty manageable stuff. I was out in California when Jose Montoya’s Valcyte research started heating up, and I thought I’d wait to see if it would pan out. It seems to have fallen by the wayside now. Anyway, yes, I agree, my concept of recovery has changed. I’d be happy to get any improvement – I don’t really expect that I could be cured. Just getting up to the point where I could be described as merely housebound would be enough for me. Jocelyn I would be curious to know if you’ve had any luck/tried anti-virals? I have positive titers for EBV, HHV6, Coxsackie B7 and Natural Killer Cells of 6. I’ve only been sick 2 years and although a cure is not out there I would like to know if I could do anything to at least stabilize. Being bed ridden and housebound, sporting my new chicken legs all within two years scares me as to the rate this ugly demon is progressing. I hear Lauricidan is an anti-viral. I haven’t done it but hear good things about it. Yikes, sorry to hear about your titers. My NKC were around there too the last time they were tested. Seven, I think. I haven’t tried prescription antivirals. Cheney’s protocol includes wormwood tincture (swish and spit), artesunate, and inosine, and I think all of those have been helpful to me. You can check out my regimen as it stood in January here. For some bizarre reason, my disease — which has a will of its own — has been worse in the past year. I’ve been housebound for a week at a time, unable to shower and wash my hair. I always took showers and washed my hair, even a few days after major surgery in the hospital. And my leg and arm pain is worse, as today. And I don’t know why. It’s unfathomable even after nearly 26 years. I can’t even read the NYT every day; it is piling up. Have no energy to hold it up. Am not reading my mysteries, and I’m an avid readers. Just no get-up-and-go here. I don’t get it. I agree with you, Jocelyn, about the no funding issue as being crucial here. And that’s because the government does not deem this an illness serious enough to fund expansive, meaningful research programs into its cause, how it works and possible treatments. To quote an esteemed doctor with this disease, if only we could act like ACT-UP. They caused HIV/AIDS to be taken seriously. They were everywhere and loud and in-your-face. If only we had the energy to do this. I think we can all email, write, call NIH and other agencies and pressure them, send out emails to everyone we know, post on blogs where to write, dazzle them with a mountain of demanding letters and calls. Do as much as possible. This is a tough period. Funds are being cut for lots of health care programs, and will be cut even more in the name of so-called deficit reduction, yet trillions are spent on war, bank bailouts and also those who can afford higher taxes are not being taxed. And we — all of us — retirees, disabled people, veterans, the most elderly — will pay the price in Medicare, Medicaid cuts and cuts to the Social Security COLA. We should all be writing and calling about this. There is money to fund research on CFIDS and all other diseases if they were priorities. So we have to make our voices heard. Sometimes it just gets worse for no reason, right? It’s unfair. I’m not able to hold books much myself. I have to be having a very good day, and I can handle only a lightweight one that mostly stays open on its own. That’s why I read so much on Google Books. Having been a performing arts kid growing up, I was probably more tuned in to ACT-UP than most my age, and I’ve long wished we could do more along those lines. Heavens knows the whole thing is outrageous. I think we’re doing a good job as a community, more and more, and we definitely have some major advantages now in terms of how easily we’re able to connect to each other, but major disadvantages, of course, in terms of what we’re able to physically achieve. Agreed: We just have to keep plugging away at every opportunity, as much as our energy permits. Hope your personal tide will turn soon, Kathy. Thank you, Jocelyn for your kind words. I so hope you feel better soon, and that there’s a treatment found that will help you. With all of the hoopla about XMRV, whatever happens, at least it brought CFS out of the closet and into the public arena — and it’s very tough to close it back in there again. So many people, including doctors and researchers have been made aware of its seriousness. I’m hoping that the Norwegian doctors, Fluge and Malle keep on plugging away. They seem determined to crack the case of this mysterious disease. Perhaps they can find out what’s going on physically to cause our symptoms and see if this “miracle cure” — although I’m skeptical of that term, can help. At least, I’m hopeful it will lead to more research and treatments. I’m a secret and frustrated ACT-UP type. I only wish I could be out there, not in here. But I know I have very good company — and the Internet has helped a lot with great blogs and kindred spirits. Are you following the terrible events surrounding the jailing of Dr. Mikovits in a Ventura jail, when she lives in that city? This situation is sinking fast to the bottom. None of this is helping CFS sufferers and is turning a research conflict into a wrestling match, or a power struggle with rich, powerful, highly connected people vs. a woman researcher. And on top of that, she was prevented from participating in Dr. Enlander’s seminar on CFS at Mount Sinai on Nov. 21. Her participation would have added one more mind into the conversation. Her being detained may have been a detriment to us. Whatever is happening, WPI is not endearing themselves to people with CFS. The blogosphere is full of criticisms of their behavior, and many who were not on Dr. Mikovits’ side, will support her against this vindictiveness. And meanwhile, none of this helps us at all. Yep, Kathy, we’re talking all about it on the No Poster Girl page. You don’t need a facebook account to see that page, but you would need one if you wanted to post. “Here’s another guess as to why [they had Judy arrested]. Here’s a quote from this ScienceInsider story. “As a person with no legal training whatsoever and who is thus possibly totally wrong, it sounds to me like somebody got a warrant to have her strategically arrested at precisely the time that would create two legal obligations on one day, and thus the greatest amount of difficulty for her and her legal team. The Scrabble double-word-score of arrests, if you will. A lawyer would know how to make that happen. And this absolutely ridiculous travesty of justice also had Dr. Mikovits in jail so she couldn’t attend the seminar organized by Dr. Erlendur at Mount Sinai, where she might have made some contributions the CFS researchers would find helpful. So we lost some information that might help crack the CFS case. This whole situation is of no use to CFS sufferers at all. It is detrimental. There is this fight which takes up money, resources, and is aimed at harming a scientist, a woman, at that. I have no idea what’s really going on here. I feel like I’m watching a segment of The Godfather: rich, powerful, highly connected family vs. a woman scientist. This must be about tons of money, maybe even the existence of WPI. Who knows? granted due process of law. I have never heard of someone being jailed and detained in a civil case. It’s outrageous. It’s also her livelihood. Just look at the Wikipedia entry on the Whittemores. It is revealing and shocking. The other point is: Given the highly connected plaintiffs in this case, can Dr. Mikovits even get a fair hearing in Nevada? As I said on another blog, WPI just shot themselves in the foot: First, by hostilely and arbitrarily firing Dr. Mikovits by phone; second, locking her out of the lab; third, filing a lawsuit against her; and fourth, whatever their role in her jailing and detention. This is how a big corporation operates against a whistle-blower. Dr. Mikovits needs lots of support. We should call the jail and call for her release, and write to whomever are the right people objecting to this, do whatever we can. Hi Jocelyn, I’m from the UK and really enjoy reading your blog. In light of you saying you didn’t do anything for a few years, I was wondering how the Gcmaf treatment is going? I know that you sadly had iris. Have you stopped the treatment, are still doing it, or on a break? Hope it’s ok asking all of this. Welcome, Annie! I remain on break from the GcMAF. I’m still waiting for the overheated, feverish feeling to abate. It’s improving, but only very, very slowly. I’m wary of taking any more and launching the whole thing all over again. Please be careful about these drugs. It’s the worst thing to have a relapse. I remember years ago when some people, including a noted health center suggested Vit. C drips. I did it twice. Both times I could not get out of bed for three days, and they did not make me feel better. So I quit. (And it was expensive!) My body just could not process whatever was going into it. Oh, believe me, Kathy, I am cautious to a fault. Sorry to hear the Myers cocktail sort of thing didn’t work for you. HI Jocelyn, thank you for your reply, appreciated. I am sorry you are still waiting for the overheated, feverish feeling to abate. I can totally understand you are wary of going back on whilst still having these symptoms and I know I wouldn’t whilst still having such symptoms. I really hope the symptoms abate soon and you can move forward…. Thanks, Annie. It is diminishing, so I think I will get there eventually – I’m not in any hurry to restart it, though. The time will come. What is GcMAF supposed to do? Suppress the B-cells as does Rituximab? I don’t know about it, but read that Dr. Enlander had discussions of this at his seminar on Nov. 20, and there was mention at a few other blogs. Kathy, I wrote a very little bit about GcMAF in this post earlier this year. Thanks, Jocelyn. Very interesting. I feel like I’ve come a CFS Luddite, i.e., stay with what I know, and don’t try anything drastic — or I’ll pay for it. I’ll try to find the magnesium gluconate spray you mention. When it comes to ‘doing something about it’, there is not so much one can do 😦 I have years where I ‘let it all be’ and times where I try out new things. Lately I have tried various pain medications and they all failed. So I mostly just tolerate it by distracting myself, unless it gets real bad. So I decided to do more: I have an appointment with a CFS specialist in…. September, yay! The other specialist has 100 waiting people before me, but I am in line there as well… These two do have treatments. One option they have is dexamphetamine which a friend of mine takes but he says it doesn’t do much, the other is B12 injections. -very careful exersize, I dance and that can be spaced in small amounts, sometimes just half a minute or just a few seconds if I’m really bad. It’s very gentle exersize. I was on this amazing forum with a weath of information, but last year they took the forum from their site and now I have no access to info about meds and treatment anymore. Suggestions are very welcome!